Celebrate the people in your life. Let us create a family heirloom that features the names of those you cherish. 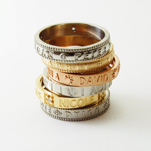 Each ring can display up to five names. New rings can be created as your family grows. Small gemstones can be inset in Family Circle Jewelry. Available in platinum, palladium, rose gold, white gold, or yellow gold. All gold used is recycled. Jewelry is created locally in our own workshop. Allow five weeks for us to create and finish your Family Circle Ring. Family Circle Rings are priced from $750 – $1000, depending on the chosen materials.